Jennifer Reynolds loves meeting new people and working with diverse populations. She is the outreach director with Bluegrass Youth Ballet and in 2013 started a bilingual outreach program in the 11th District’s Valley Park. Jennifer is also fluent in Spanish and a qualified medical interpreter. Jennifer grew up in Central Kentucky and has traveled extensively. She and her husband lived in Central Mexico for several years where she enjoyed using her background in anthropology to do community outreach. She cultivated relationships, worked with children in various capacities, taught educational classes in Spanish, held small groups in her home, and owned a CrossFit gym. With over ten years of experience in fundraising, non-profit work, and community outreach work Jennifer will bring young, new energy to Lexington’s Urban County Council. 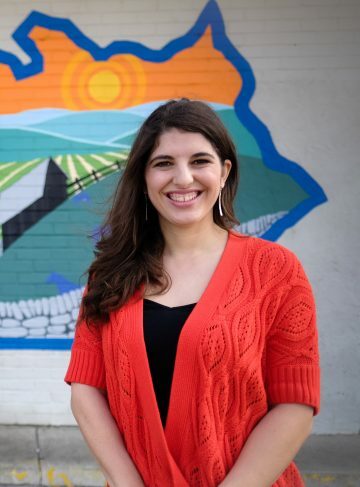 Her background in anthropology and community service will aid her in caring for all of the 11th District and give her a unique perspective on Council. Jennifer is a working mom and juggles multiple undertakings. She and her husband of 15 years have a son and love spending time together and supporting one another in each other’s endeavors. Being active in the local community, Jennifer loves attending local events, shopping and eating at neighborhood businesses. Yes, I favor prioritizing infill and redevelopment as a primary growth strategy. I believe in making efficient use of our current urban service boundary before we expand any further. As a city we must continue development within our current boundary in order to accommodate the rapid growth we are experiencing, and I support infill and redevelopment projects if and when they take the surrounding residents into consideration, are thoughtfully planned, and do not force longtime residents and business owners out of their homes. The 11th District has an Oxford Circle Feasibility Study because residents have identified Oxford Circle’s need for revitalization. I think plans are a good idea when possible in order to communicate with residents about the type of development they want for their own community and the plans should be implemented. At the same time we should be protecting our unique, beautiful farmland so that we can continue with our successful equine and agrarian industries. A lack of developable space and need for more affordable housing would be the main reasons I could think of that would cause me to reconsider an expansion of the boundary someday in the future. The 11th district, like many other places in our city, is full of a diverse housing stock. We have many homes:, some newer homes, many older homes of different sizes, duplexes, and apartment buildings. Residents love their neighborhoods and are proud of where they live. Many people moved into certain areas for the aesthetics, the feel, and diversity. As housing stock ages, it’s important that we empower the current residents of our unique neighborhoods to assist in the planning of infill. While talking with neighbors in my district many are concerned about the effect infill is having and may have on their communities. They are concerned about houses that do not fit the character and appearance of their neighborhoods, houses and buildings that are too tall, too large, or use materials that do not maintain the neighborhood’s architectural integrity. One neighborhood association is looking into adding an ND-1 overlay to their neighborhood and others have already done this. I believe empowering our neighborhoods to lead the way in setting standards and regulations for new buildings is a positive step to ensuring that the attractiveness and appeal of our communities is not compromised by infill projects. Property owners can responsibly construct new buildings without negatively impacting the character of existing neighborhoods. Similar to the previous question, the affordable housing issue needs more engagement. Within the 11th District, there are many areas where new housing is being developed and the perception, and sometimes the reality, is that the fee for rent or ownership out-prices many who have lived in the area before redevelopment. My recommendations to address this involve looking at the facts around what price point is needed to respond to the demand and working with my colleagues and government staff to develop and support incentives that allow affordability in building and consequently in rent. We have some examples in Lexington, and even within my district where this is working effectively like AU Associates ‘s Parkside Apartments off of Cross Keys. I want to work to increase similar developments while allowing flexibility for those who are working to respond appropriately to our housing needs. Within my own district, the communities of Christian Towers and Lafayette Place remind me daily how important it is to support and enhance the quality of life of our senior residents. As we develop and re-develop our city, we must prioritize the needs of our senior community while also responding to the needs of all of our residents. Gil Penalosa, with 8-80 Cities, has visited Lexington and given his own assessment of how to implement affordable neighborhood interventions which could help to improve the quality of life for all residents from 8 to 80 years old. I support the types of interventions he presents about; whether it is accessible housing, wider sidewalks, or more public spaces for outdoor gathering with others. Including these types of low-cost interventions in development or redevelopment could help insure our senior communities are allowed the best quality of life Lexington has to offer. I support the concept of the PDR program and its intention. The PDR initiative is a large part of keeping our farmland into the future as well as maintaining our unique niche in tourism. Once elected, I look forward to having conversations with the Rural Land Management Board, the LFUCG Planning Department and members of the Planning Commission to determine a way in which we can keep the program’s intention and funding without causing an imbalance in the needs and priorities of the city. I continue to be impressed with the increased energy around the Central Kentucky tourism efforts. A quick visit to the VisitLex or Share the Lex websites shows the variety of ways in which Lexington has embraced its history and character and has marketed it to visitors. Horse Country has helped connect people to the horse industry through things like horse farm tours which give a close-up look at our beautiful horse farms. Agriculture is also a huge component of our appeal to tourists. Once elected, I plan to support initiatives that link our agricultural community with opportunities for tourism, as well as engaging 11th district and Lexington residents in the endeavor. Unfortunately, in many cases adding more lanes is not a feasible option due to how we have developed our city; however, we can make a better effort toward streamlining our traffic flow to be more efficient and toward decreasing the number of cars commuting to work by making Lexington more bicycle and pedestrian friendly. I would support a project to collect traffic data on our major arteries in order to see what might be done in terms of making Lexington traffic flow more efficiently. I think our city could also improve cyclist and pedestrian safety as well as promote more park-and-ride programs that would allow commuters to park on the periphery of the city and ride LexTran buses into the city. Yes, I support the creation of a new process, and I appreciate the efforts being made as an attempt to respond to development and economic needs while considering the impact on neighborhoods, traffic, and infrastructure. I would want an engagement process to accompanies it. If the process is undertaken similar to the On The Table initiative, with all voices at the table, I would feel better about the outcome. If it is done in a manner that keeps certain people out of the conversation, I would not be able to support it. I look forward to continued conversations with my constituents about any long-term land use decisions and being able to share that input and insight with my colleagues on council. As I converse with people in my community, I have noticed that each resident has a very personal idea of what the most important challenge is facing Lexington and their district. One of the greatest challenges I see is for the city is for it to remain unique among cities. Lexington is known for our horses, agriculture, healthcare, professional services, and education. If we focus on improving and expanding these areas, then we will also create job growth in other sectors. Similarly in the 11th, we need to focus on our distinctness. We have a wonderful opportunity to work together as the most diverse district in Lexington. We have great neighborhoods, a central location, beautiful parks, grocery stores, and numerous other local businesses. Opportunities abound to come together in order to work on common issues. The challenge in the 11th is bridging the gaps between the neighborhoods and the different people who live throughout the district so that they can organize and work with their councilperson to make the district a more beautiful, safe, cohesive, peaceful place for all residents. My goal as councilwoman is to build bridges and help unify the district.